Milagros de la Torre is torn from her family and home on the mythical and idyllic Caribbean island of Las Brisas after an attack by bandits from a neighboring island. With help from family—and a little magic—she ends up on a small island in Maine, where the 12-year-old must overcome loss and make a new home. Milagros de le Torre hasn’t had an easy life: ever since her father sailed away with pirates she’s been teased at school and there’s the constant struggle for her family to make ends meet. Still, Milagros loves her small island in the Caribbean, and she finds comfort in those who recognize her special gifts. But everything changes when marauders destroy Milagros’s island and with it most of the inhabitants. 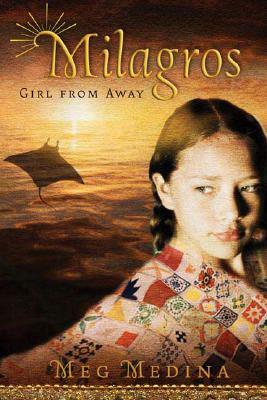 Milagros manages to escape in a rowboat where she drifts out to sea with no direction, save for the mysterious manta rays that guide her to land. In stunning prose,Meg Medina creates a fantastical world in which a young girl uncovers the true meaning of family, the significance of identity, and, most important, the power of a mother’s love. Read an excerpt of Milagros here.